Enter SPRING10 at checkout for 10% off all tuning products! We’ve had a steady stream of incredible vehicles coming to our Chelmsford HQ for a free fitting this month, despite the tumultuous weather! Choosing a car of the month was no easy task but this TTs does tend to stick in the mind. The owner of this one put his Quattro system to good use and tackled the beast from the east to get his hands on the CRTD4 tuning system. The CRTD4 system increases power and torque whilst smoothing out power delivery, creating a more responsive driving experience. Installation is a quick job and doesn’t require any technical knowledge, however our expert tech team are always on hand to assist and answer any questions you may have. Once installed the TT pulls hard throughout the rev range, even more so than it did before. The main feature of the CRTD4 however is the fact that it does not make any permanent modifications to the vehicle. The ECU is left un-besmirched so removing the CRTD4 will return the TT back to its original condition. This keeps your warranty in-tact and ensures reliability as the engine is always controlled within its original safety parameters. The CRTD4 revolutionises your driving experience and offers great gains without making any permanent modifications. Should you need to change or sell your vehicle your CRTD4 tuning system can be reprogrammed to fit your latest acquisition. For now though this customer can enjoy the gains achieved from his CRTD4 tuning system. More power or more economy? With the TDI Tuning App you can decide directly from your driver’s seat. 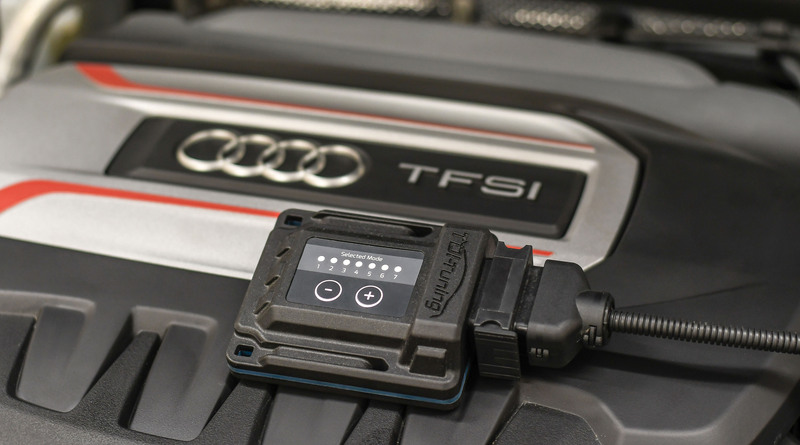 Instantly change the performance of your engine and adapt your vehicle to suit any situation. Keep up to date with company news and receive exclusive offers! © 2019 TDI Tuning Ltd. All rights reserved.